The i-Safe Pram System is designed to transport your baby or toddler in comfort from birth to 3 years or 0-15 kg max. We are proud to present this wonderful high quality product to all parents in the UK & Europe, the amazingly light weight aluminium chassis yet rigid provide a fantastic experience when out and about yet folds away so easy and small for the smallest car-boot Folded: 54cm x 96cm x 59cm Yet the beautiful expendable handle provides maximum comfort when out and about for for most heights required. A a very large shopping basket was fitted to the i-Safe System for maximum practicality when shopping or carrying your little ones belongings. A super padded seat unit with multi positions recline and adjustable footrest complete with 5 point padded harness will give maximum safety and comfort for the little one. 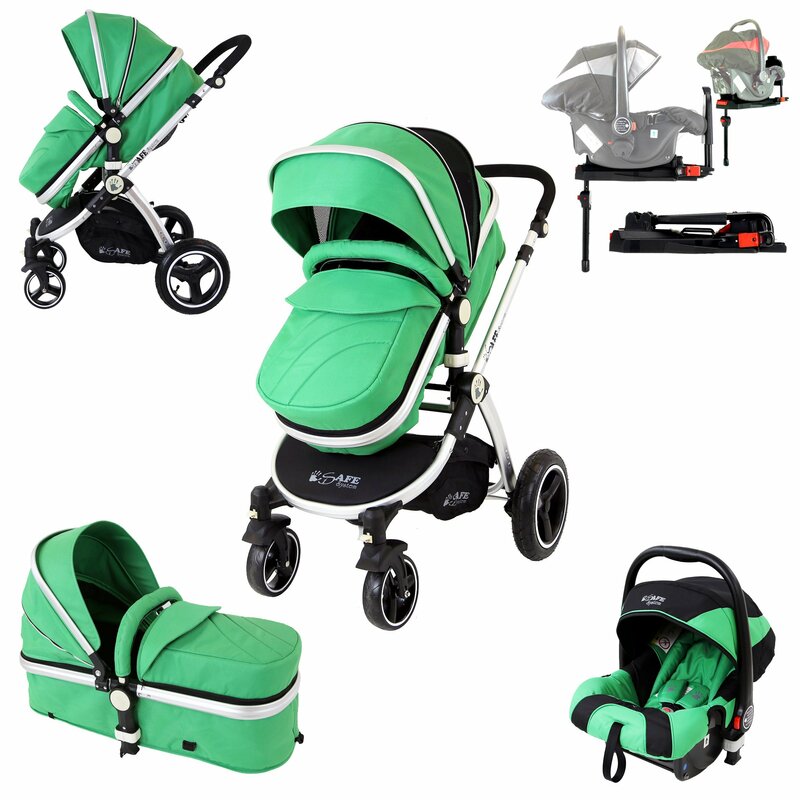 Complete package with Seat Unit Convertible To Carrycot Mode, Carseat, Chassis, Seat Unit, All in one Raincover, this fantastic package is a must have for your little one! iSafe Pram System Complete 0+ Car Seat & iSOFIX Base. A Luxurious Product With Features Like No Other! A Truly State Of the Art Product Built With The Parent And Baby In Mind! Luxury Carseat Included & Complete With Head Support & Padded Shoulder Straps, iSOFIX Compatible (Included!) Large Hood Like No Other Car Seat On The Market To Provide Superior Comfort & Protection For The Baby. Light WEight Yet Superior Design & Quality This Carseat Is One Of The Finest & Safest Car Seat In The UK. Luxury iSOFIX Base, The Most Versatile iSOFIX Base Super High Quality & Safe Is Included With The iSafe Pram System. Easy And Safe To Install This Must Have Accessory Is Part Of This Amazing Package!